While iFreeTools already has support for database-trigger based workflow execution, which can execute tasks like sending out email or SMS, adding of new records or editing existing records in database and for re-indexing records (to recompute formula field values), there can be automation scenarios wherein some workflows need to be triggered periodically, for a specific set of records. recomputing formula fields of specific records (for example the formula field for Age can be recomputed for records which have Date of Birth on that day). To enable automation for such scenarios, we have enabled support for Scheduled Workflows. As a specific example, let us consider a subscriber database which needs to be notified about the upcoming renewal date for their subscription. The actions to perform in this example, has an email configured to be sent to the subscribers about the upcoming renewal date, like shown below. 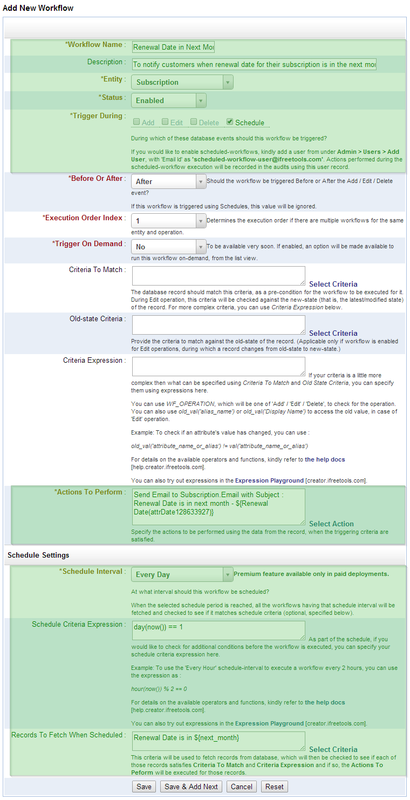 The full work-flow configuration for the sample scheduled workflow is given below, with the relevant sections highlighted in green. Apart form normal workflow configuration details like Workflow Name, Description, Entity and Status, for the Scheduled Workflow configuration, the Trigger During value needs to be specified as Schedule. The other non-relevant sections of the configuration page can be left with the default values. Under the Schedule Setting section, we have specified the Schedule Interval to be Every Day, but since we want this to execute only on the 1st of every month, we add a Schedule Criteria Expression as day(now()) == 1 . On the other days, the expression will evaluate to false and will not fetch the records to execute the actions. The Records To Fetch When Scheduled specifies that only the records which have the Renewal Date in the next month needs to be fetched, for which the specified actions will be executed. All actions performed during the Scheduled Workflows will be audited under scheduled-workflow-user account. Scheduled Workflows will be a premium feature available for paid customers. For efficient use of computing resources, the scheduling options will be disabled by default in the paid single-tenant deployments and can be enabled on request. Hope you find this feature. Feel free to let us know your feedback on how we can enable more such automation for you. Until now, we had restricted the ability to import data (as CSV files) and the ability to being able to unlock any of the locked records, to admin users alone. Due to the nature of these operations, we believed that such a restriction would be necessary. Some customers wanted to enable these permissions to trusted users, but at the same time did not want to provide full admin permissions, considering those users to be in an intermediate permission level. Based on their requests, we have now made it possible to enable non-admin users to import data and to be able to unlock any records using Auth Profiles. 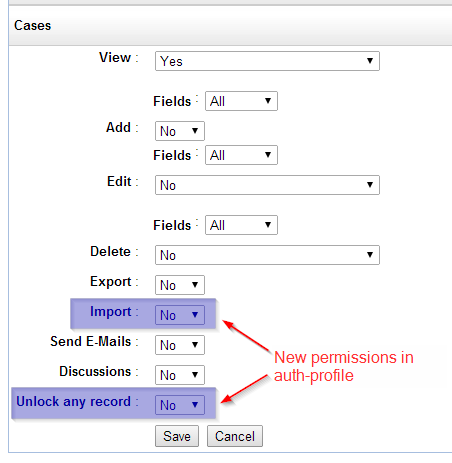 While Import permission will be configurable for all entities in the Auth Profile form, the Unlock any record permission will be available for configuration only for entities which have record locking enabled. Hope you find the new features useful. Feel free to let us know your feedback on how we can make things better for you in your online database application creator. iFreeTools Creator, your online database application builder built for hosting on Google App Engine, has had support for image fields since the early days. These image fields used Google App Engine's datastore to store the files. Due to the design of the App Engine datastore, the maximum file size for these fields was limited to 1 MB. We had an automatic size-reduction enabled for these fields, to reduce the file sizes of the uploaded files. This field has been serving our free-users and our paid-customers well until now. For bigger files, there was always the option of storing them within Google Drive and attaching the files from Google Drive to database records. But these attachments are treated different from the normal fields. So, some clients have been requesting support for bigger file uploads. Based on a prioritization request from our client, we have now enabled support for bigger file uploads for our paid single-tenant deployment customers. Paid deployments will now have an option to add new attributes with Image / File Upload (Big) data-type. These new attributes will store the file contents in Google App Engine's blobstore. The blobstore allows files of sizes up to 32 MB to be uploaded, utilizing the 5 GB free blobstore quota, offered by Google for all Google App Engine applications. We have started rolling in this feature for our paid customers. If you are a paid customer of iFreeTools, you should see this feature available in your deployment very soon. Do you have a feature request for iFreeTools that you want to be prioritized? Get in touch with us, so that we take this forward. 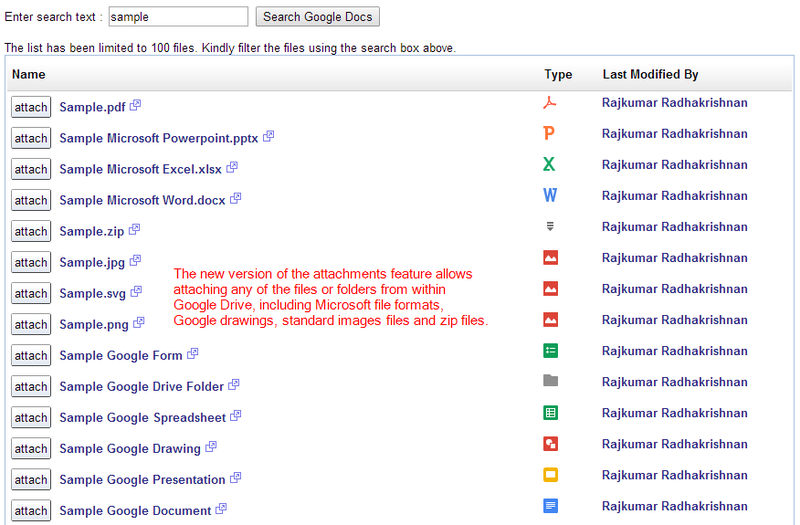 Following our recent back-end changes in iFreeTools, we are now glad to enhance our Google Docs attachment feature, to now support attaching any files/folder from within Google Drive. With the recent upgrade and subsequent changes, we have moved to using latest version of Google services and have integrated with Google Drive API. This has enabled us to allow attaching any of the files or folders from within Google Drive, including Microsoft file formats, Google drawings, standard images files and zip files. The attached files or folders will get listed under the database record's details page. Like in the earlier implementation, the attachment process does not duplicate the file contents, but creates an association with the database record within iFreeTools, so that you can access the latest version from within the record's details page. The sharing permissions configured for the file/folder in Google Drive will hence remain enforced. Hope you like the new feature. Feel free to send in your feedback on how you think we can make things better for you in iFreeTools. We have recently invested in migrating iFreeTools code to the latest computing environment on Google App Engine. As a result of these changes, iFreeTools is now able to utilize computing resources in a better way, than it was possible earlier. The new version having these changes has already been rolled out in our free multi-tenant deployment, hosted at http://creator.ifreetools.com and we are in the progress of rolling this version for all single-tenant deployment customers. If you are a user of the free multi-tenant deployment, you will be glad that we can serve more of the growing number of free applications. You may have also already experienced lesser latency than earlier, in the recent days. If you are paid customer, using our single-tenant deployment option, you will be able serve more users with lower computing instance hours. This is now possible because each computing instance can handle more than one request at the same time (multi-threaded processing). These back-end changes also enable other possibilities and new features, including some features which have been oft requested by our users. Keep following our blogs for more details on these new features.